There has been much debate about brain waves and telepathy. Science was not in favor of the idea, disposing of the subject as being “Accidental”. Almost all of us remember the laboratory experiences of people like Robert van de Castle, Stanley Krippner and Montague Ullman in the ’70s. There was a lot of debate about the accuracy and the repeatability of the experiments. More and more science seems to meet magic. We all loved the fact that science helped a paralised lady to drink. The latest inventions use brain waves to make objects fly. 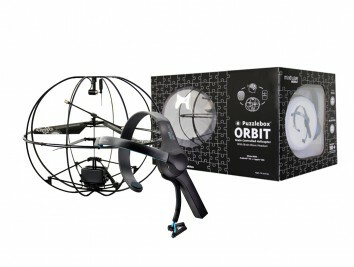 The Puzzlebox Orbit, a former Kickstarter project has gone viral, and raised 74,799$. Joshua Marcias has a background in electrical and biomedical Engineering. His business partner Steve Castelotti from Puzzlebox is a computer scientist. It is about time science and magic meet. Take a look how using brain waves makes the helicopter fly. Concentration is needed to create the brain waves that keep the helicopter floating. Puzzlebox is marketed as a tool to learn people to focus, meditate and concentrate. The more one uses these abilities, the more the brain gets familiar with it. Even though this is not a proven fact, it is a very cool gadget to play with. The Puzzlebox orbit helps you to concentrate and clear your mind. If you are focused, your mind produces a specific type of brainwaves. These brain waves are picked up by a control set. If brain waves are able to set a material object, a drone, in motion it make you wonder what else brain waves are capable of. Sending out waves to another mind? Your brain is used to the brain waves of your spouse (that is why a lot of people are not able to fall asleep when their loved one is not around). Connecting with other people, or even worlds like the ancient people thought? Would it be able to create a fascilitation device that enables you to connect with another brain? Anyway, this is a very cool gadget, I would love to have one! Do you like this post? Feel free to like and share. As a teaching tool for focus and sustained concentration the Puzzlebox is an interesting device. Today’s electronic flood of e-mail, instant messages, online chats, etc. is found to be the cause of information overload and heavy multi-tasking. More and more research supports this as a basis for distraction. Scientists say our ability to focus is being undermined by bursts of information. This considered, using brain waves for focusing has some practical use. As for a facilitation device connected to other brains, even if able to work through the miasma of 100 billion neurons sending electrical pulses to the brain, the emotional components that stimulate the neurons to begin with may be sadly compromised. From an organic point of view the more we engage in nonlocal travel, the more naturally adept we may become at telepathically communicating with like-minded humans. As our neuronal capacity increases we’d be better able to spread the seeds that will harmonize Earth’s discordant energy. Perhaps one day we will be known as planetary restorers. cool subject & cool gadget! Next PostNext Does tarot predict your future?